This is the bag that I mentioned was giving me such trouble. I call it my hobo slouch bag, modeled after one I saw at Target recently. It kills me to think that this bag was selling for only $9.99, and that it cost me more to make (not to mention the time! ), except that I didn’t like any of the prints it came in. What I did like was it’s size and super long strap that could be worn across the body or tied in a knot to shorten. My version is very soft and lightweight, almost like a pillowcase, but sturdier. There is a lined magazine size pocket on the outside and smaller pockets inside for my phone and camera. Besides drafting the pattern and the actual sewing, the hardest part was finding the solid grey fabric to match the side print I wanted to use. Greys are so tricky! They tend to be either too blue or too brown. 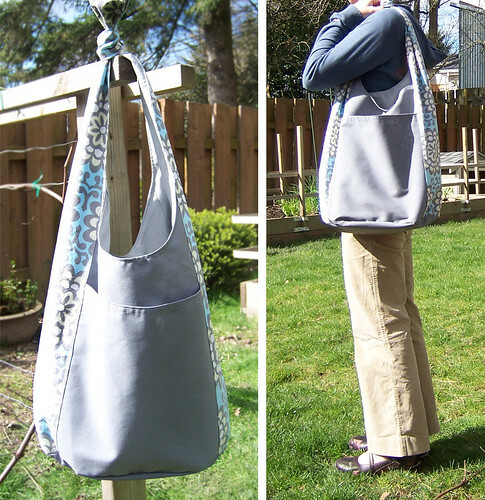 In the end, the fabric for this bag came from 3 different fabric stores. Not very fuel efficient, I admit, but hopefully useful and re-usable in the long run. Well done! I like it, especially the colors. I think that it is no matter that you spent more money on it than you would have in a shop as long as you are satisfied with it. Sometimes I do the same but I am never sorry. I really like this bag! Love the fabric choices! It looks fantastic! It may have cost more, but it’s exactly what you want and that’s what matters. It came out great– definitely worth the time, effort, and cash. Cute bag! I bet you would like the Amy Butler Swing bag (I mentioned it before). The bag came out great. I love Kona Cotton solids. They have really nice grays. Ooh, very cute, I’m so impressed! I’ve been dreaming of bag just like this. Nice job! I am as well interested in the pattern for this hobo slouch bag. I la la love it! The extra magazine pocket is the ticket!